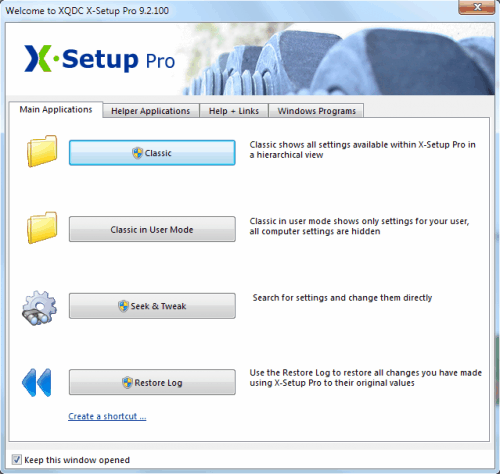 X-Setup Pro is a Windows tweaker that is compatible with all versions of the Microsoft operating system. The company filed for insolvency and had to shut down all operations regarding X-Setup Pro. The developers have posted a serial number on the X-Setup Pro homepage which can be used to activate and use the program (in case you lost your serial number, they state). X-Setup Pro can be installed or used as a portable edition. Both programs provide the same functionality and are linked to from the homepage. The program starts with a welcome screen that can be used to launch the tweaker, restore changes that have been previously made or use the seek and tweak option to make changes directly to the system. The welcome window links to additional helper applications and Window system tools as well. Selecting Classic or Classic in User Mode will launch the actual tweaking window (the first shows all settings that can be modified while the second only those that affect the current user). X-Setup Pro uses a plugin based system. All available plugins are loaded on startup and displayed in the left column sorted into categories like Network, Internet or Common Annoyances. Selecting one of the options usually displays multiple subcategories or entries that can be used to manipulate system settings. The appearance category for instance displays multiple subcategories including notification area, explorer or desktop which either show subcategories on their own or the items that can be changed. Each item is displayed in the right half of the window. The top contains the items that can be changed while the lower half information about the functionality of the item. Making changes to the checkboxes provided and selecting Apply Changes - or pressing F9 - will make the change to the system. Users looking for a specific item can use the search form provided at the top of the screen. Another user or computer registry can be loaded into the program to manipulate settings for other user accounts or PCs. Users can change way over 1900 different settings of the Windows operating system with this tool. The sheer number of categories and settings can be confusing at times, especially for inexperienced users. Another downside of using X-Setup Pro is that it will not be developed any further and that the developers will not provide program support anymore. The program is on the other hand a comprehensive Windows tweaker. I’ve used X-Setup within all its versions since practically always I think. Makes me a bit sad to see the company fly away. Life goes on. X-Setup is very good software, though these last two years I’ve encountered a few tweaks which led to problems here. Beware, backup Registry before, as always. This was THE tweaking tool back in the day. It was freeware at first, too. Funny, I recently downloaded the last free version from another site.